A PSI gauge is pressure gauge that reads out in pounds per square inch. There are hundreds of different models of PSI gauges designed for a huge variety of industrial and processing applications. PSI gauges are typically sold and used in the US and UK. 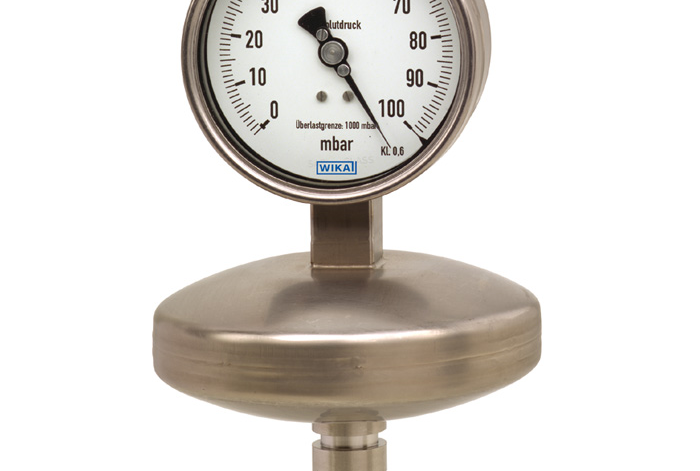 A standard or relative pressure gauge measures pressure with a Bourdon tube or other technology. In most cases, a standard pressure gauge is used to determine the difference between the pressure in a pipe or tank and the pressure of the ambient atmosphere. A relative pressure gauge must therefore have a vent to connect it to the external atmosphere. The technical term in the US and UK for a pressure reading given by a relative gauge is pounds per square inch gauge (PSIG). WIKA offers a complete line of standard PSI gauges, with a wide variety of models designed to meet the needs of different industries and applications. Absolute pressure gauges operate using the same technology as standard pressure gauges, but are zero referenced against a perfect vacuum instead of the ambient atmosphere. Absolute pressure devices are used when measuring quantities where absolute values must be determined (altimeters, lab and scientific applications). The technical term in the US and UK for a pressure reading given by an absolute gauge is pounds per square inch absolute (PSIA). WIKA offers six separate models of absolute pressure gauges for industrial and scientific use. A differential pressure gauge is used to determine the difference between the two separate physical areas. For example, a differential pressure gauge is typically used in filter monitoring to check the pressure differential from one side of a filter to the other. With this kind of monitoring system, if the pressure differential drops below a critical threshold, an alarm is triggered so the filter can be replaced by a technician. Because of their high quality and industry-friendly design, tens of thousands of WIKA differential pressure gauges are in use today in refineries, chemical and manufacturing plants, and pharmaceutical facilities around the world. WIKA is one of the largest PSI gauge producers in the world, and our reliable and accurate pressure gauges help get the job done right. WIKA technical support is here for you. Feel free to call or email if you have any questions about PSI gauges or pressure measurement, or if you are just interested in learning more about the latest developments in pressure instrumentation.